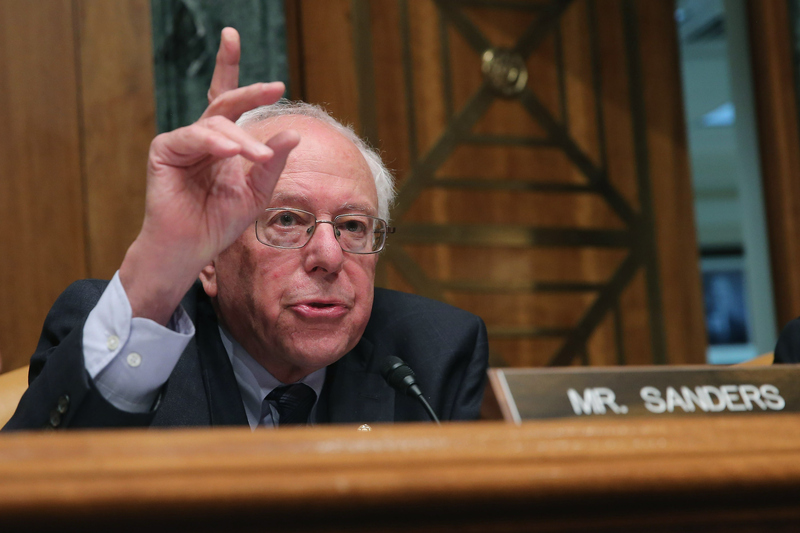 Yes, that's a picture of Bernie Sanders, but don't be deceived: The 2016 presidential campaign of this self-declared democratic socialist from Vermont is about way more than just him. Organizers across the country are working to redefine what a win might mean in Sanders' campaign, and a central theme seems to be that the grassroots organizing that is currently taking place could and should be able to occur even if Sanders were not running. By addressing issues like Fight for $15, #BlackLivesMatter, and climate change, Sanders is pulling supporters from various movements, which is essential if he hopes to garner enough support to challenge Democratic front-runner Hillary Clinton. In a June interview with Katie Couric on Yahoo, Sanders explicitly addressed the effectiveness of community mobilization. We need a political revolution, in my view, where people begin to stand up and fight and take on the big money interests. If we don't have that, no president — not the best president in the world — will ever be able to accomplish anything. Sanders has said that he's not just running to push Hillary to the left, but to win the presidency himself. However, the real victory here would be the mobilization of millions of people for issues they care about. In the Couric interview, Sanders mentioned that President Obama was mistaken in saying he could "take it from here" following his inauguration in 2008, and he's right — however things go for Sanders, communities must continue to organize and challenge systemic injustice. Therefore, it is important to look at some key movements that have intersected with Sanders' campaign and see how grassroots organizing is already playing a big role in the 2016 elections. American workers have been mobilizing for living wages long before Sanders made his way into the national spotlight, and they will go on doing so until the minimum wage is increased. Fight for $15 is a three-year-old union-backed coalition that aims to increase the national minimum wage and bring attention to other issues faced by workers, and this year, it found a high-profile ally in Sanders. Along with Massachusetts Sen. Elizabeth Warren, Sanders took the lead on a letter to the White House asking Obama to use his executive power to “harness the power of the presidency to help these workers achieve the American Dream" in the fight for a union and a $15 minimum wage. Economic justice is a focal point of Sanders' work, and working class individuals can use Sanders' campaign as an opportunity to generate awareness. The Fight for $15 movement does not and never did hinge on Sanders' campaign, but now that he has adamantly demonstrated his support for it, organizers might want to treat him as an important political ally. In this case, redefining a win might win using the momentum of Sanders' campaign to push for a living wage, whether or not he wins the election. The intersection of the Fight for $15 movement and Sanders' campaign is important because it reveals who Sanders is really fighting (Wall Street and big money) and fighting for (the working class). For starters, this movement is absolutely not about Sanders. Sanders is a white male who, even if he is advocating for marginalized folks, cannot and does not claim to be the target of state-sponsored violence against black bodies. The #BlackLivesMatter movement was founded after George Zimmerman, who killed Trayvon Martin, was acquitted, and continues to combat systemic racism and oppression today. The intersection between Sanders' campaign and #BlackLivesMatter is not quite as explicit as the connection to Fight for $15. Sanders frequently discusses mass incarceration, youth unemployment rates, and police brutality across the intersections of racial and economic justice, which is important. But he falls short of fully supporting this movement, choosing instead to attribute #BlackLivesMatter to "phraseology." That does not mean #BlackLivesMatter activists should completely give up hope on Sanders, though. What it does mean is that they need to push Sanders on this issue and encourage him to continue talking about issues like youth unemployment, and state violence in the context of structural racism. It is significant that Sanders understands and addresses the relationship between economic and racial justice. It is something that Martin Luther King, Jr. frequently emphasized, and it is something that remains critical. But redefining a win here would mean that communities of color, who have been organizing against racial violence for a long time, push Sanders and other politicians to be better allies and work for them as much as anyone else, without losing any momentum after election season. Sanders has a much stronger track record on this issue than Clinton, who found herself in hot water at a recent New Hampshire town hall campaign event after she was called out for accepting contributions from the fossil fuel industry. During his time in the Senate, Sanders has spearheaded bills to tax carbon, allocate funding for clean energy, end "polluter welfare," and help state and local governments pay for efficiency programs. Not all of these bills passed — and some didn't go very far — but climate change is another key focus of Sanders' campaign. But, as with the other two movements mentioned here, the fight for climate justice did not start with Sanders, and it is much bigger than him. However, climate justice activists should value Sanders' passion for the issue, and his emphasis on the intersection between the climate justice and economic justice movements. Redefining a win here is simple: Climate justice activists should continue organizing events like the People's Climate March to put pressure on Washington, but also turn out to support Sanders because he has already shown a willingness to make combating climate change a top priority. The crucial thing to remember about Sanders' complex relationship with Fight for $15, #BlackLivesMatter, and climate justice is that these movements were started by organizers on the ground. Sanders has the privilege of being in a position of power and receiving an increasing amount of national attention, but that does not make him the focal point of these movements. These movements could and should be happening even if Sanders were to disappear into obscurity. However, he has already been an important ally and could be a better one if organizers simultaneously put pressure on and support him. After all, he sees the necessity of intensive mobilization, and is seeking a political revolution.